From July 1 to 10, LG fans will get the chance to purchase LG Optimus 2X - the World's First Dual Core Phone (that's according to The Guinness Book of World Records) at a discounted price in all participating LG retail stores across the archipelago. 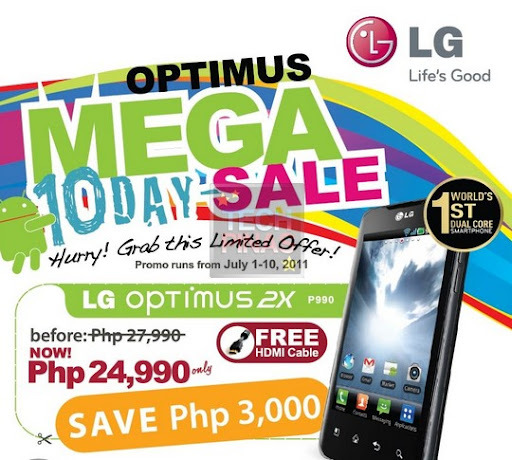 From having a regular price tag of Php 27,990, Android-powered LG Optimus 2X will go for as low as Php 24,990 on the above-mentioned dates. That's a whopping Php 3,000 off! And you even get a free HDMI cable! In NCR, the following malls are covered: SM Manila, SM Mega Mall, SM San Lazaro, SM Marikina, SM North EDSA, SM Fairview, SM Mall of Asia MOA, Robinsons Manila, Power Plant, Trinoma, Market Market, Tutuban Center Mall, among others.